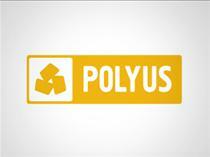 MOSCOW, Feb 11 (PRIME) -- The net profit of Russian gold producer Polyus plummeted by 62% on the year to U.S. $474 million in 2018, as calculated under International Financial Reporting Standards (IFRS), the company said in a report on Monday. Revenue went up 7% on the year to $2.915 billion in 2018. Earnings before interest, taxes, depreciation, and amortization (EBITDA) rose 10% to $1.865 billion, with the EBITDA margin rising to 64% from 63%.